The book contains thirty original articles dealing with important aspects of theoretical as well as applied economic theory. While the principal focus is on: the computational and algorithmic nature of economic dynamics; individual as well as collective decision process and rational behavior, some contributions emphasize also the importance of classical recursion theory and constructive mathematics for dynamical systems, business cycles theories, growth theories, and others are in the area of history of thought, methodology and behavioural economics. The contributors range from Nobel Laureates to the promising new generation of innovative thinkers. 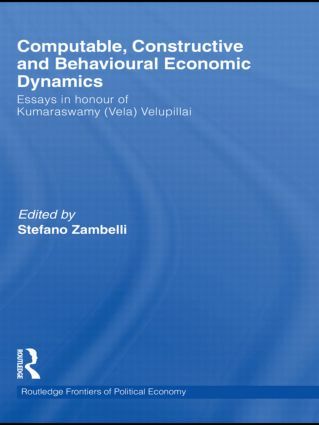 This volume is also a Festschrift in honour of Professor Kumaraswamy Vela Velupillai, the founder of Computable Economics, a growing field of research where important results stemming from classical recursion theory and constructive mathematics are applied to economic theory. The aim and hope is to provide new tools for economic modelling. This book will be of particular appeal to postgraduate students and scholars in one or more of the following fields: computable economics, business cycles, macroeconomics, growth theories, methodology, behavioural economics, financial economics, experimental and agent based economics. It might be also of importance to those interested on the general theme of algorithmic foundations for social sciences. ByJ . BARKLEY ROSSER , J R .
Rational economic man: A centrepiece in social science? Who, in Scandinavian economic theoretic literature, picked up major threads from Wicksell’s writings?